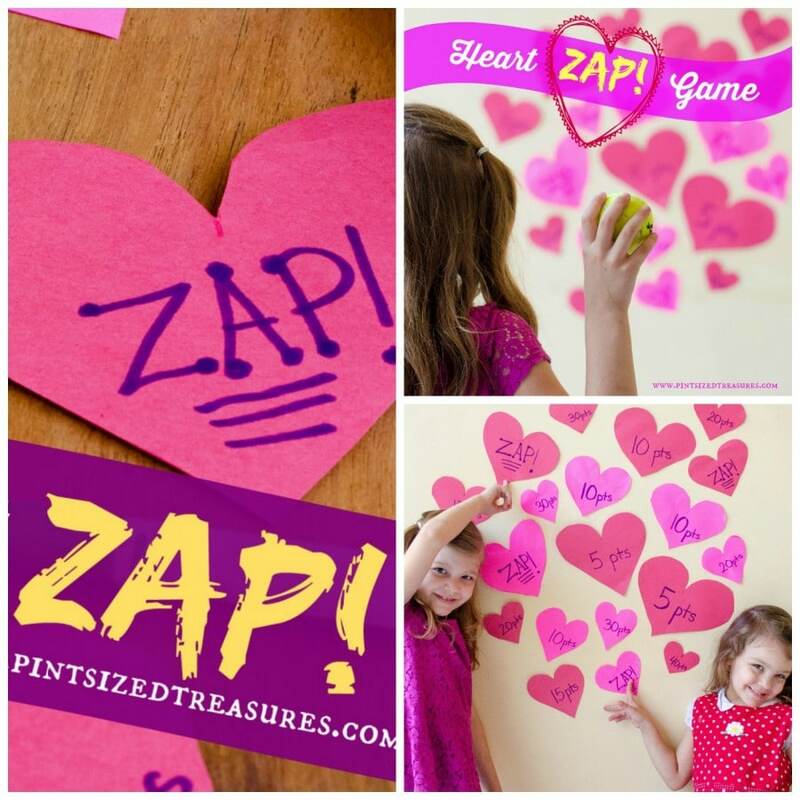 What do you need for this super-fun, heart ZAP! game? Got all your supplies now? Just a wonderful, awesome side-note: this game is works well for a wide range of ages. Toddlers and teens both LOVE to play it — over and over again! I love games that require few materials, teach skills, work for a variety of ages and are crazy fun. This game gets a 10 in ALL those categories. Why can this game work for toddlers, tweens and teens? With a few variations, you can easily make this game age appropriate for your kids or class. You can find all the variations below! 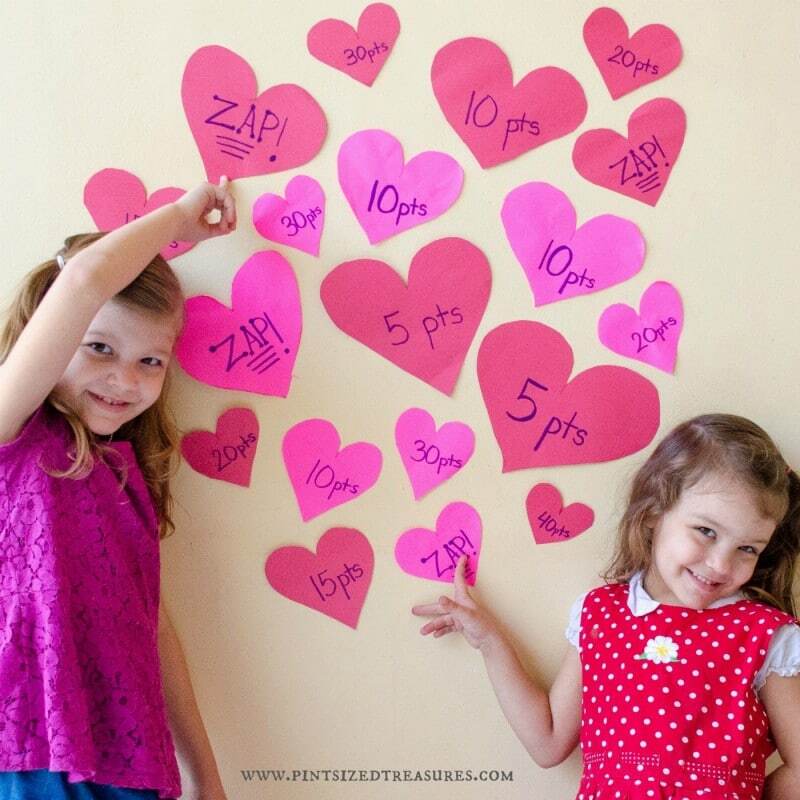 Draw a variety of 40 hearts (different sizes) and one 8 inch heart. Once you have your hearts drawn, write down point values on the hearts. ( 5 – 40 points range.) 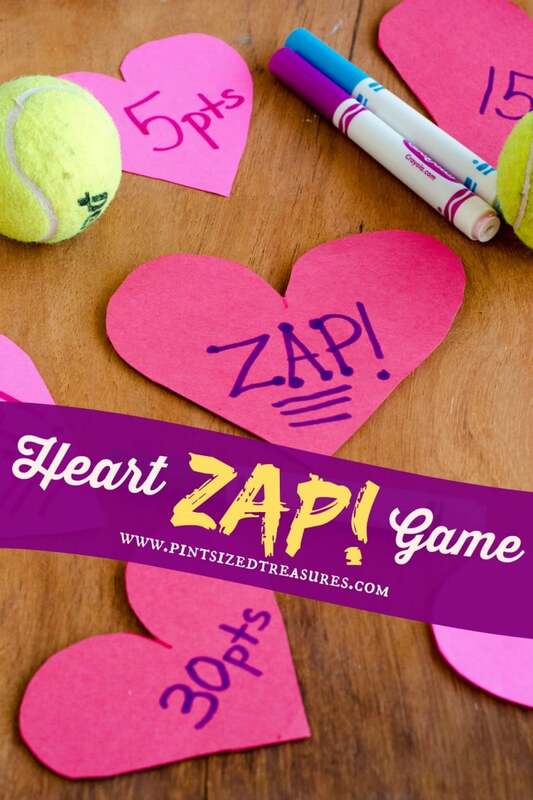 On five of the hearts write the word, “ZAP!” *My method is to write the larger point values on the smaller hearts, and the smaller point values on the larger hearts. Cut out all the hearts. 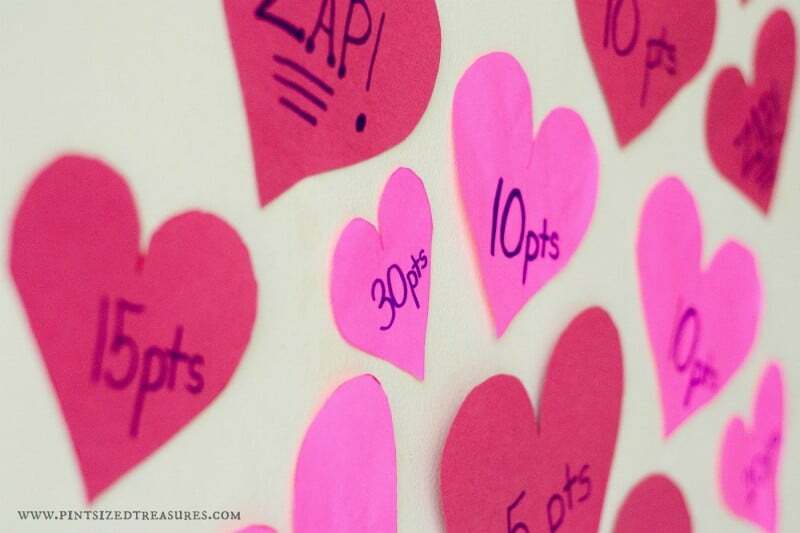 Now, pick a large wall and tape the hearts in a group with the Zap! hearts put in strategic places. For example, you will want to place the Zap! hearts near the 30 and 40 point hearts. Next, take your 8 inch heart and tape it in a spot on the ground/floor where you want the player to stand. This makes it fair for everyone so no one is inching forward during the game. 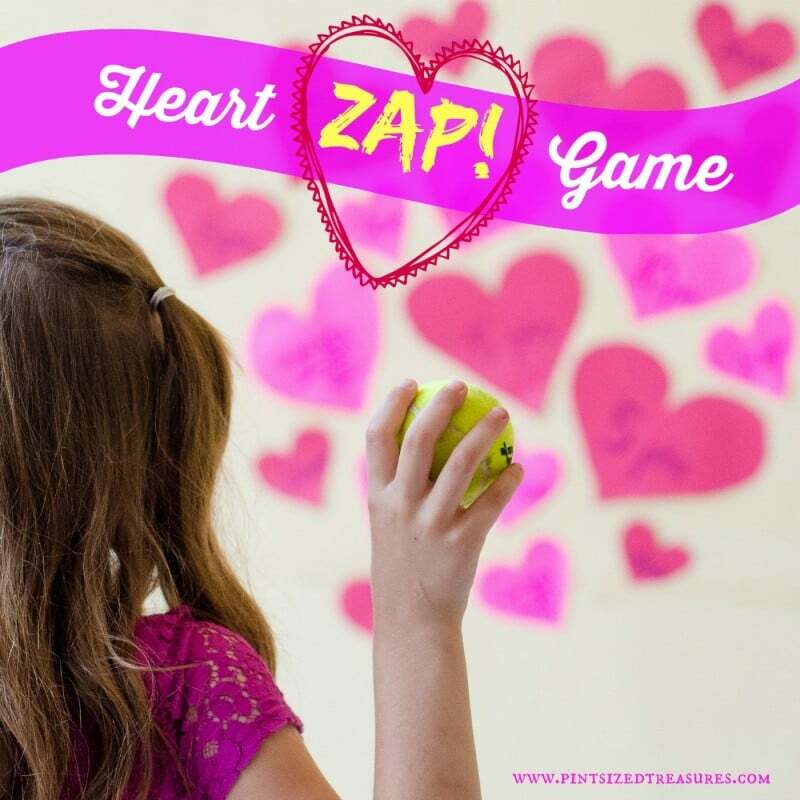 How To Play Heart Zap! To decide who goes first, have each player bounce a tennis ball at the hearts. Whoever hits the highest point value heart begins the game. Each game consists of five rounds and each round consists of 10 bounces per player. Once you have the starting player, instruct that player to throw the tennis ball at the hearts, but the ball HAS TO bounce ONCE before touching the hearts or the player loses that turn and receives zero points. Each player gets 10 bounces per round. If a player hits one of the ZAP! hearts during the game (before the five rounds are complete), all points are lost! Pick a scorekeeper to keep score throughout the five rounds and tally the scores at the end. The player with the most points at the end of five rounds is the winner! This can get crazy, but is FUN! Have two players play their rounds simultaneously. Players can throw at the same time and hit the other person’s tennis ball without receiving deduction of points. Just watch out for the Zap! Each player still receives 10 bounces in one round and there are five rounds per game. No tears, only giggles version! Do not place numbers on the hearts, only have blank hearts and hearts that say “Zap!”. In this version, the toddler gets extra hugs, cheers and kisses when they land on “Zap!” No one loses!